Tonight at the MGM Grand Garden Arena in Las Vegas, UFC 116 went down in what was promoted as the best UFC fight in the history of MMA. 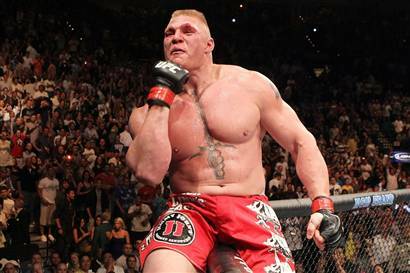 Heavyweights Brock Lesnar and Shane Carwin entered the octagon to settle the undisputed heavyweight championship title and Brock Lesnar came out as the victor. Brock Lesnar defeated Shane Carwin via submission (arm triangle choke) at 3:52 of the 2nd round to remain the undisputed UFC Heavyweight Champion. Shane Carwin came into the fight the underdog, and during the UFC 116 pre fight press conference, Carwin acknowledged his underdog status. Carwin stated that he is used to being plugged as the underdog. And in fact, it’s what makes him (Carwin) fight even harder during his bouts. However, tonight was not one of those nights where Carwin would come out on top – Brock Lesnar is now, without question or debate, the UFC heavyweight champion. And I’m sure that Shane Carwin acknowledges that fact respectfully as well after being defeated.